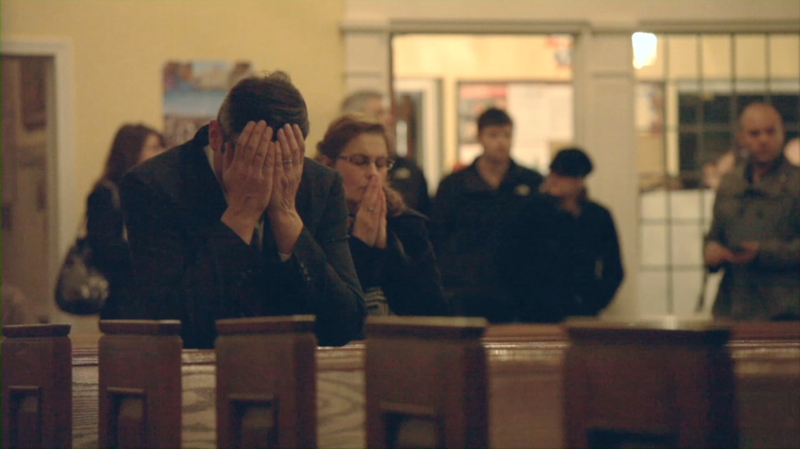 Twenty-six funerals consumed the Newtown, CT, community with shock and grief after the massacre at Sandy Hook Elementary School on December 14, 2012. Photo courtesy Jennifer Cox. “Of the 26 dead, most are children,” reported NBC Nightly News anchor Lester Holt to a nation stunned by the shooting at Sandy Hook Elementary School in Newtown, Connecticut, on December 14, 2012. Six educators and 20 six- and seven-year-old students were murdered that day in their classrooms by an emotionally disturbed young man armed with sophisticated handguns and a semi-automatic AR-15 assault rifle snatched from his mother’s exotic gun collection. His mother was also a casualty of her son’s rampage. Newtown joins the small and growing list of recent outstanding films, Tower and Marathon (see my reviews on February 14, 2017 and November 21, 2016, respectively), that focus on mass murders perpetrated on American soil by disenfranchised young men. Unlike the former two films, however, Newtown features no interviews with physically wounded survivors because once shot, the shooter’s tiny victims had no chance of survival. 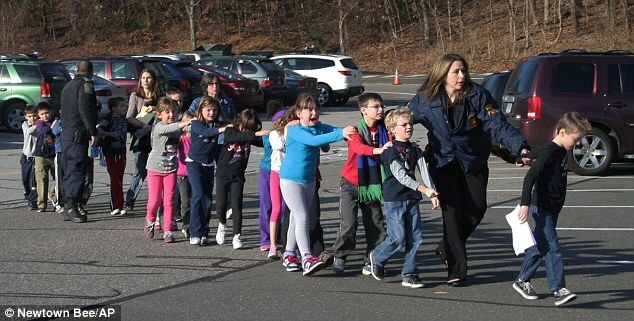 Connecticut State Police led a line of children from the Sandy Hook Elementary School in Newtown, Connecticut, after the shooting at the school. Photo: © Newtown Bee/AP. The film replays the traumatic timeline of that chilling day, from the frantic 911 calls and EMT and police reports to the gathering at the local firehouse, where anxious parents awaited news of their children’s well-being. This is not an easy film to watch. Your tears will fall as parents; adolescent siblings; neighbors; a teacher and a local priest; and medical and law enforcement professionals recall their own and their community’s losses in deeply personal terms. You might even suffer a sudden wave of nausea, as I did, during a medical director’s painful recount of the number of bullets that shattered each child’s body. Three parents–Mark Barden, David Wheeler and Nicole Hockley–are especially articulate witnesses to the many stages of grief that they and their families have endured. They openly acknowledge their inability to forgive and forget. They cherish baby teeth and locks of hair, and are incapable of disposing of boxes of toys and clothing. They have become vocal social activists in the fight for stricter gun control laws and background checks. 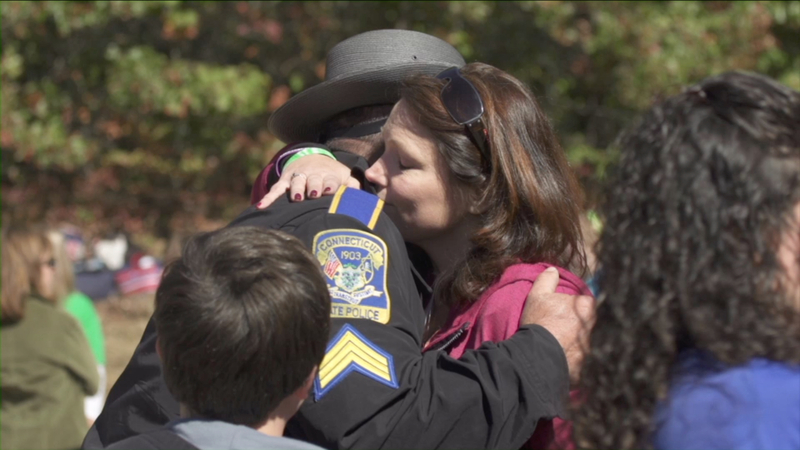 Nicole Hockley, mother of Sandy Hook victim Dylan Hockley, with first responder Sgt. William Cario. Photo courtesy of Derek Weisehahn. Nicole Hockley remembers the grief that she and her husband overcame when their son, Dylan, was diagnosed with autism only to face his incomprehensible death in what was supposed to be a safe and nurturing environment. Her only measure of comfort: Dylan died with his teacher’s arm around him, so he wasn’t alone. She is determined that his memory not be forgotten: “He has a legacy that I will fulfill for him,” she says. Grieving dad David Wheeler explains the difficult decision to have another child, for the sake of his surviving son. Musician dad Mark Barden, who continues to compensate for the storms of grief that envelop him, was compelled to revisit the school one last time before it was razed, so he could experience the site where his son, Daniel, lived his last moments. Daniel Barden used to love racing his school bus. When he was 7, he was killed at his Sandy Hook Elementary School. His dad, Mark Barden, is featured in NEWTOWN, airing on INDEPENDENT LENS. Photo courtesy Mark Barden. Despite the fact that the toll of gun violence in urban and suburban communities across the country continues to rise, the debate surrounding gun control legislation remains more divisive than ever. Hopefully, this film will encourage viewers to press their state Senators and Congressmen and women to do what they were elected to do…pass legislation that will keep their constituents safe. I urge you not to miss the PBS premiere of Newtown on Independent Lens tonight, Monday, April 3, 2017, 9:00-11:00 p.m. ET/PT; 8:00-10:00 p.m.CT/MT. (Check local listings to confirm air times and repeat broadcasts in your region.) The film would best be watched in the company of family or friends, followed by hugs and quiet discussion. It might be one of the most important documentaries you’ll share this year. This entry was posted in Film, TV and tagged David Wheeler, Gun Control, Gun Violence, Independent Lens, Kim A. Snyder, Maria Cuomo Cole, Mark Barden, Newtown, Nicole Hockely, Sandy Hook Elementary School, Sandy Hook Promise, School Shootings. Bookmark the permalink. I’m sure the film is well done, but I just can’t bring myself to watch it. Living through it once was more than enough. It is difficult to watch, I agree; but it’s so important as a reminder to those with the power to implement positive change in our gun control laws and strengthen background checks. As one of the moms who lost a child at Sandy Hook says in the film, she never thought the kind of violence she saw on TV news would ever touch her community or her family.